Buffets can be intimidating. There are so many options for food, so many choices you can make, and only so much room in your belly. How are you supposed to taste a little bit of everything? How do you get the absolute most out of a buffet? At Baba Ghannouj Mediterranean Buffet, we have many delicious options for you to choose from, but making the choice may be very difficult. So, here are some tips for you to get the most out of our delicious buffet items, remember these hints next time you stop by for a mediterranean feast. The first, and probably most important tip, is to know your options. You want to know what you have to choose from before you start making decisions. Look at everything, decide what you want to try, and then go back and fill your plate. You can also check out our buffet menu before heading in, you know, mentally prepare and get excited about all your choices. Don’t go and fill your plate like it is your last meal. Take a little bit of the things you want to try, this way you can actually try them all and go back for your favorites. 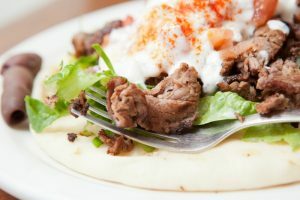 We know our falafels look amazing, and our gyros are mouthwatering, but try a small portion of these delicious items before overloading and getting full too fast. That is one thing you want to avoid when trying to get the most out of a buffet, getting full too fast. We get it, you want your stomach as empty as possible before you head into our buffet restaurant. But starving yourself beforehand will only make your stomach shrink, resulting in you getting full faster, not being able to eat as much as if you had only had a normal breakfast. You want to stay hydrated, so drink water before. This will help you break down the food you are about to stuff your face with. But avoid drinking too much during your meal, especially carbonated drinks, which will bloat you and cause you to feel full faster. We understand that is it all-you-can-eat, but that doesn’t make this a race. Eating slower will keep you from bloating, leaving more room in your belly, allowing you to eat more. So take your time, enjoy each bite you take, and save room for dessert! Getting the most out of an all-you-can-eat buffet is something that everyone wants to do, but they rarely make it happen, probably because they make many of the common mistakes when it comes to buffets. You can do better than them, now that you have these tips. 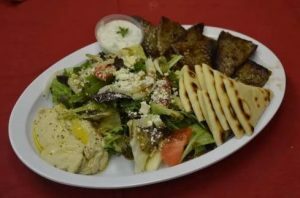 Baba Ghannouj Mediterranean Buffet has a lot of great, delicious options. By following these tips, you could try a little bit of everything and maybe even go back for seconds! So next time you stop by Baba Ghannouj, make sure you keep these in mind and get ready to dig in!